On occasion, I’m required by my place of employment, to visit London. I’d rather not to be honest since I’m not overly fond of any city but London, being the largest and busiest city I visit on a regular basis, is my least favourite one. Still, needs must, that’s where the government (who I need to talk to every now and again) hang out and that’s where most of the industry events are held, although god knows why, it must be the most expensive place on earth to organise a gathering of people. So every three months or so I, a man who grew up in a house from which only fields, hills and a mountain could be seen, finds himself in one of the most heavily populated places in the Western world. And I don’t really enjoy it. The streets are not paved with gold for sure. It’s dirty, smelly and noisy, there’s too many people there and so many people seek to disengage themselves from those around them. The water tastes like wee, everything is massively expensive (despite me being hugely aware that it makes me look like a country bumpkin, I still exclaim at the prices of things), and everyone is in such a rush! And so we come to getting about the place. Now normally, much like many visitors, and no doubt many permanent occupants of London, I navigate using the tube map. It’s easy to follow, I know it quite well and in a strange masochistic way, I actually quite enjoy the tube. There’s an engineering precision to the tube that appeals to the geek in me, there’s a whole shitload of unwritten rules about behaviours that just seem to work and I enjoy thinking about the effort that goes into the creation and operation of such a system. I’ve also spent enough time in London to understand that the tube map IN NO WAY REFLECTS THE SURFACE WORLD, WHATSOEVER. So when ever anyone suggests ‘we just walk from Marble Arch to Green Park’, I’m instantly suspicious about what this will mean. Obviously I’m a fit chap but staggering 15 miles across London carrying a laptop and overnight bag doesn’t sound like a great plan to me. However, it turns out this isn’t any great distance, about a mile, and we can walk through Hyde Park, splendid. 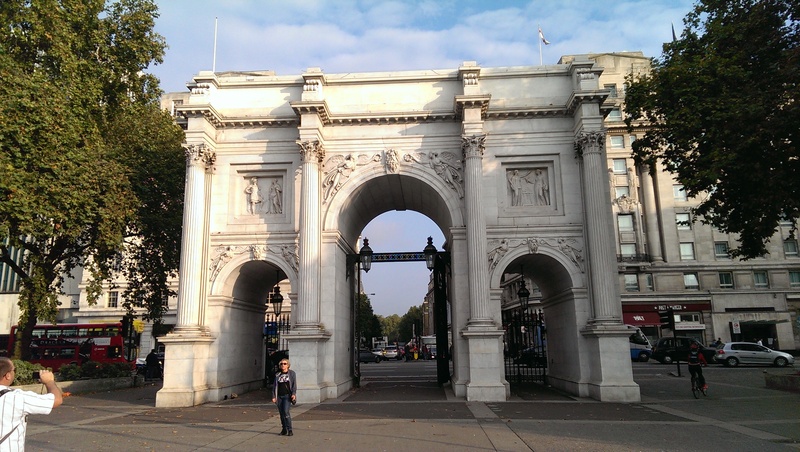 I can take pictures of Marble Arch and stuff. 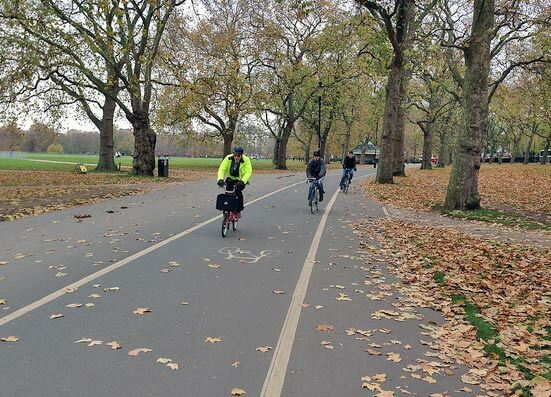 What none of us realised, is that 5 million people cycle through Hyde Park every ten minutes. It was a lot busier than that, I can tell you. Anyway, after nearly dying from all those reckless cyclists, it came to my attention that there were far, far more people cycling than there were cars travelling along Park Lane. I don’t know what the normal figures are like but in rush hour cyclists hugely outnumbered cars. And yet the cars had this huge dual carriageway to travel along whereas the cyclists (who had opted not to battle it out with the cars), were stuffed onto a thin strip of tarmac in a park. We as pedestrians through that park had more space than the cyclists and yet they outnumbered us more than they did the cars. However, it is visits like this the re-open my eyes to the sheer scale of cycling in London. You simply don’t see that scale of cycling anywhere else in the country, even pro-rata (I guess I should add a Cambridge and possible Oxford disclaimer here), but virtually the rest of the country. Up here in pie-land we’re lucky if we get a bit of paint on the road, we actually think that’s a worthwhile step forwards but that’s because we are talking hugely different numbers. When I visit London and move more than a few meters top-side, I do fully accept that this city needs a massive and fundamental shift in provision of cycle-infrastructure. Keep complaining Londoners, keep campaigning and hopefully you will eventually get something that works for everyone that the rest of us can aspire to.